Quinoa, spelt, Kamut—the latest noodles are nutritious, delicious, and super filling. By now, no doubt you've been advised hundreds of times to avoid white pasta. But does that mean you have to give up noodles altogether? No way! These days the pasta aisle is loaded with alternatives. Read on for the lowdown on five different types, and delicious recipes to try with each one. Pros: It's gluten-free and a great source of B vitamins. Bring a large pot of water to a boil. Have ready 2 bowls of ice water. When water boils, add 1 tsp. salt, peas and edamame and bring back to a boil. Cook until tender, 3 to 4 minutes. Using a slotted spoon or sieve, transfer vegetables to a bowl of ice water. Add sugar snap peas to pot of water and bring back to a boil. Cook until just tender, about 30 seconds. Transfer to other bowl of ice water, reserving boiling water. Once vegetables are cold, drain well. Cut sugar snap peas into fourths crosswise. In a serving bowl, whisk together lemon juice, vinegar and mustard. Add oil in a slow stream, whisking until thickened and well combined. Stir in shallot and tarragon. Season with 1 tsp. salt and ½ tsp. pepper. Cook pasta in reserved pot of boiling water until al dente, about 12 minutes or according to package directions. Drain pasta well and immediately transfer to bowl with vinaigrette. Add vegetables and cheese. Gently toss together until pasta is well coated. Season with additional pepper, if desired. Serve at room temperature. Pros: This ancient variety of wheat technically called khorasan wheat (Kamut is a brand name) boasts omega-3s, along with magnesium and zinc. 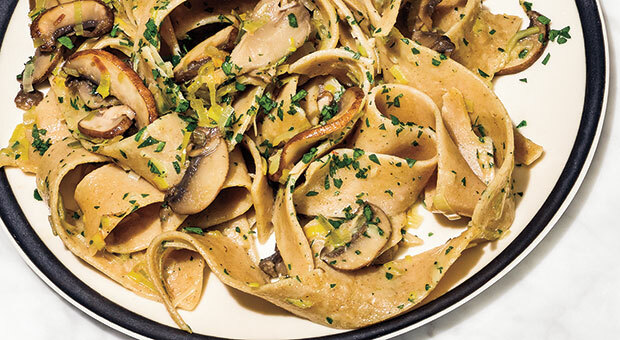 Best for: It’s similar in texture to regular pasta, with a buttery, slightly nutty flavor. Use it in any pasta dish—baked, sautéed or cold in salad. Bring a large pot of water to a boil. In a large nonstick skillet, warm oil over medium-high heat. Cook sausage, stirring and breaking up lumps, until golden brown, about 3 minutes. Add onion, rosemary and ½ tsp. salt. Reduce heat to medium and cook, stirring, until tender, about 3 minutes. 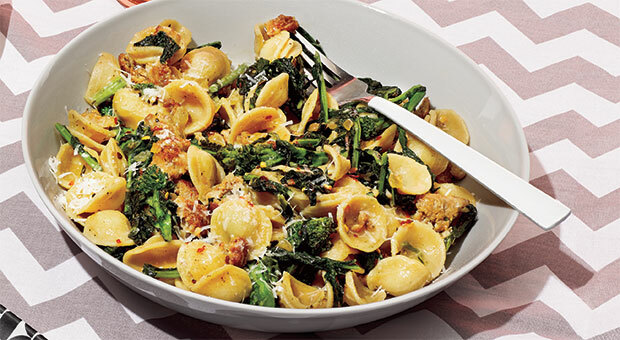 Stir in broccoli rabe, garlic and red pepper flakes and sauté until broccoli rabe is tender, 5 to 8 minutes, adding broccoli rabe by handfuls if skillet is too full. Remove skillet from heat. Add 1 tsp. salt and pasta to boiling water. Stir and cook until pasta is al dente, about 10 minutes or according to package directions. Reserve ½ cup cooking water; drain pasta. Add broth, ¼ cup cheese, pasta and cooking water to skillet. Cook over medium heat until liquid has reduced and coats pasta, about 3 minutes. Divide pasta among bowls, sprinkle with remaining ¼ cup cheese and additional red pepper flakes, if desired, and serve. Pros: It has a sturdy texture and an earthy, nutty flavor. Plus, it has double the fiber of ordinary pasta, with fewer calories. Best for: Use it in any pasta dish—hot or cold in salad. Bring a pot of water to a boil. In a large nonstick skillet, warm oil over medium-high heat. Add leeks and shallots and sprinkle with ½ tsp. each salt and pepper; sauté until tender, 5 minutes. Add mushrooms; sauté until cooked down, 7 minutes. Pour in wine; simmer until reduced by half, 2 minutes. Remove skillet from heat. Add 1 tsp. salt and pasta to boiling water. Stir and cook until pasta is al dente, 9 minutes or according to package directions. Reserve ½ cup cooking water; drain pasta. Add pasta, cooking water, broth, mascarpone and parsley to skillet. Cook over medium-low heat, stirring, until liquid has reduced and pasta is well coated, 3 minutes. Season with additional salt and pepper, if desired. Pro: It has a tender texture and a mildly nutty flavor. This ancient grain is rich in protein, fiber, iron, B vitamins, magnesium and zinc. In a large nonstick skillet, sauté pancetta over medium heat until golden, 3 minutes. Add onion and red pepper flakes; sauté until onion has softened, 3 minutes. Add garlic; sauté for 1 minute. Pour in wine; simmer until almost evaporated, 30 seconds. Add tomatoes with juice and tomato paste, squeezing tomatoes to break them up. Simmer, stirring frequently, until reduced and thickened, 10 minutes. Remove skillet from heat. Bring a pot of water to a boil. Add salt and pasta. Stir and cook until al dente, 7 minutes or according to package directions. Reserve ½ cup cooking water; drain pasta. 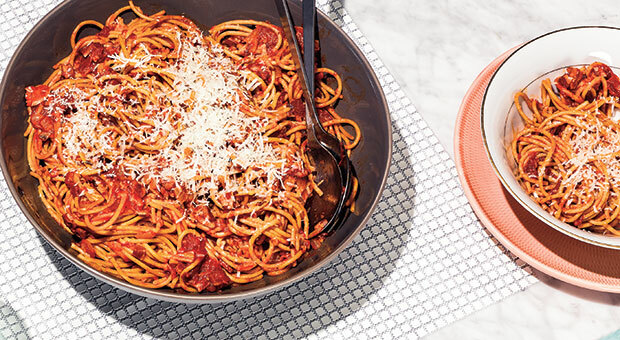 Add cooking water, pasta and ¼ cup pecorino to skillet. Cook over medium heat, stirring gently, until pasta is coated and sauce has reduced to desired consistency, 2 to 3 minutes. Top with remaining ¼ cup pecorino and additional red pepper flakes, if desired. Pros: It has a delicate, silky texture and very mild flavor. Also, quinoa contains more protein than any other grain; it's a complete protein, meaning it delivers all the essential amino acids. Best for: Any pasta dish, hot or cold in salad. Preheat oven to 450ºF. 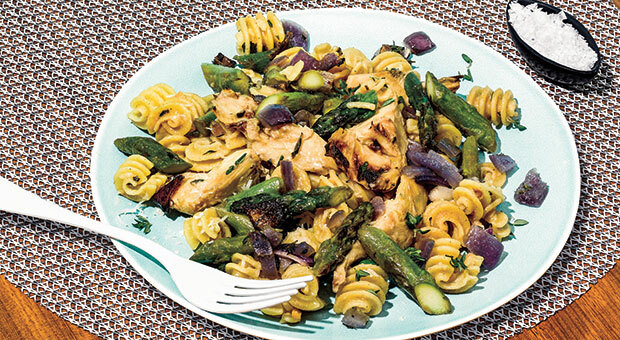 In a bowl, toss asparagus, artichokes, onion, 2 Tbsp. oil, thyme and ½ tsp. each salt and pepper. Spread on a baking sheet. Place each garlic half, cut-side up, on a piece of foil. Drizzle each with ½ tsp. oil. Wrap tightly; place next to vegetables on sheet. Roast, stirring vegetables occasionally, until vegetables are golden and garlic is soft, 20 minutes. Unwrap garlic, squeeze out cloves and mash. Bring a pot of water to a boil. Add 1 tsp. salt and pasta. Stir and cook until pasta is al dente, 9 minutes or according to package directions. Reserve ½ cup water; drain pasta. In a large nonstick skillet, warm 1 Tbsp. oil over medium heat. Add vegetables, garlic, vinegar, cooking water, pasta and ½ tsp. each salt and pepper. Simmer, stirring, until pasta is well coated. Top with Parmesan.